If you’re trying a grain-free diet like Paleo, SCD, or a Whole30, breakfast often feels like the most affected meal. There are good grain-free granola options, but on a Whole30 even those are usually out because of sweeteners – and most bacon is too! So you end up with eggs. Followed by eggs. With eggs the next day cooked slightly differently. Then a banana. Then more eggs. Oh yes, my friend, we’re suffering from “my own bowl” syndrome over here. And there’s no time for baths after every meal, so we get a lot of crunchy hair after our best attempts at cleaning him up. Mmmmm…save a little in your ear for later, little buddy. Luckily the sponsor of this post, Squooshi, has a fix for that. But first, the recipe! 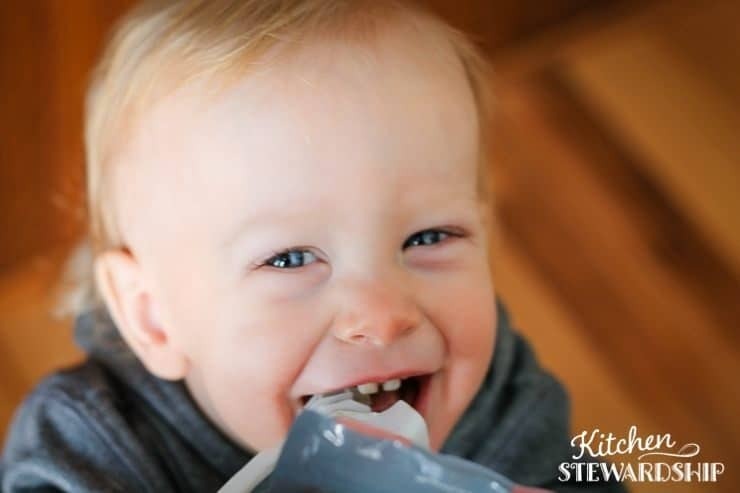 This baby is so versatile, you can truly skip or adjust amounts on pretty much every single ingredient, which rocks. It’s a great one to assign to kids (as long as they don’t measure teaspoons of salt like tablespoons – which happened this weekend on some pancakes! Caught in time, luckily, and we just had to quadruple the batch to compensate…). I decided to let it out of The Healthy Breakfast Book this morning! I’m a big fan of getting some veggies in breakfast, though, so we always default to this one. I bake up and puree lots of butternut squash in the fall so I have a stash in the freezer until about May, depending on how often we make this recipe and these easy, low-carb pumpkin pancakes. Grain-free living usually excludes porridge, which is sad. This recipe will make you happy. And full. And it smells good. Add extra spices if you’re that kind of person! Whisk everything except the coconut flour (use the code STEWARDSHIP for 10% off at that site!) (use the code STEWARDSHIP for 10% off at that site!) together in a medium pot. Heat over low to medium heat, stirring frequently to prevent burning. As the porridge warms up, add a quarter cup coconut flour and stir it in; continue to heat a few minutes, stirring often, and evaluate the texture. If you would like the porridge thicker, add coconut flour ½ tablespoon at a time until you like the consistency. 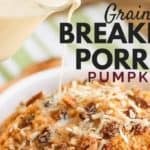 Serve warm with raisins, chopped pecans and/or walnuts, an optional pat of butter on each bowl, optional milk, and optional extra syrup for pure decadence. * This recipe serves 4, but we always double it for our family. If it’s the only thing you’re serving for breakfast, it really only serves 2 hungry people. 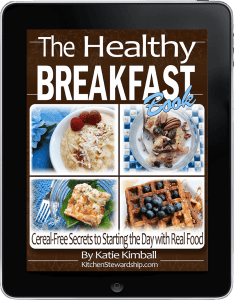 * For a Whole30, omit the vanilla extract and maple syrup and use the dairy-free milk and fat options. 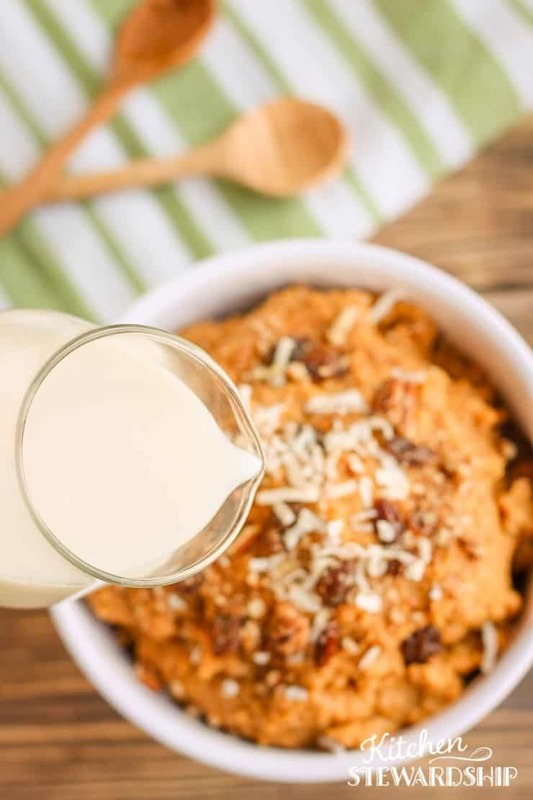 * Just about every ingredient can be optional on the list, except maybe the orange veggie and the milk, and there’s even some leeway there. If you don’t have one thing or another, don’t sweat it. * Add 2 eggs for extra protein. * If it seems bland, add salt, just a little at a time. You can also increase the spices, but tread lightly. * Spice variations: Try 1 ½ tsp. pumpkin pie spice, 1 ½ tsp. cinnamon only, or any pumpkiny blend you’d like to try. * Sub for coconut flour: you can just use shredded coconut (use the code STEWARDSHIP for 10% off at that site! ), run through a dedicated coffee grinder like some people have for milling flax seeds, or whizzed up with a high-powered blender. * Inspired by Sweet Basil and Spice. 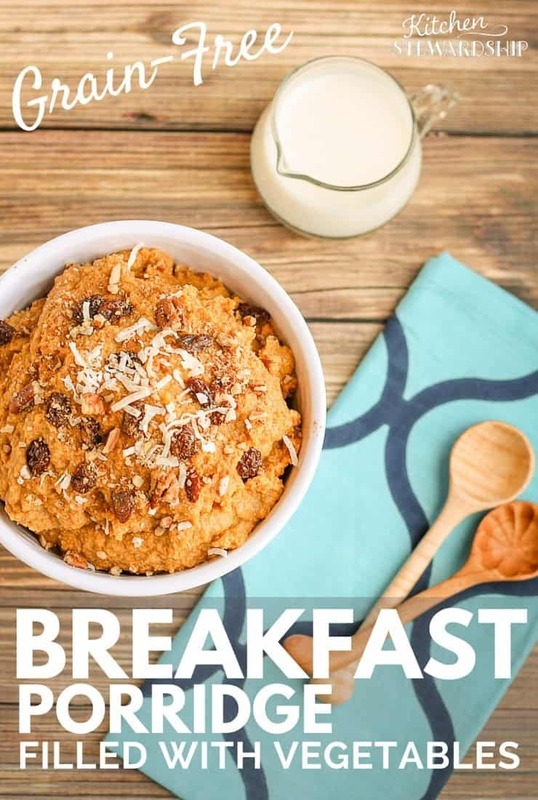 If you’re looking for more ways to spice up breakfast – and streamline your cooking and planning time – you’ll love The Healthy Breakfast Book, which is allergy-friendly and packed with recipes and techniques to help you avoid cereal every day. 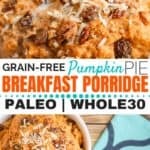 I’d like to offer you a free printable version of this Pumpkin Pie Grain-Free Breakfast Porridge, taken straight from The Healthy Breakfast Book so you can get a feel for the style the recipes in the book are written. 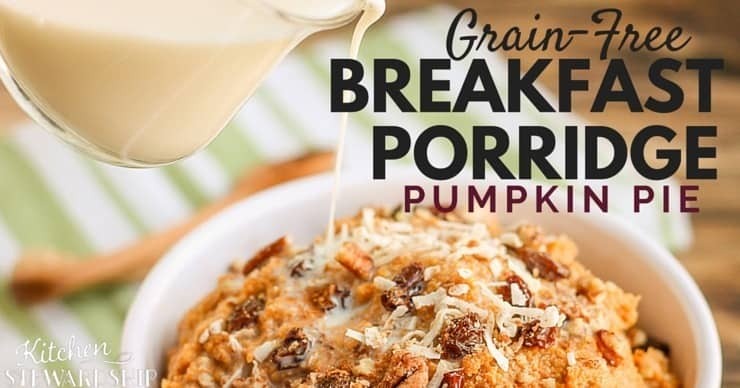 Click to get the printable recipe right away, and we’ll send it to your inbox for later so even if you are on mobile and can’t print it right now, you’ll have it available when you’re ready for it. When you grab the full version of The Healthy Breakfast Book, you also get a 50% off coupon for The Healthy Lunch Box, arguably one of the most used books in our family! And now to fix the messy problem. 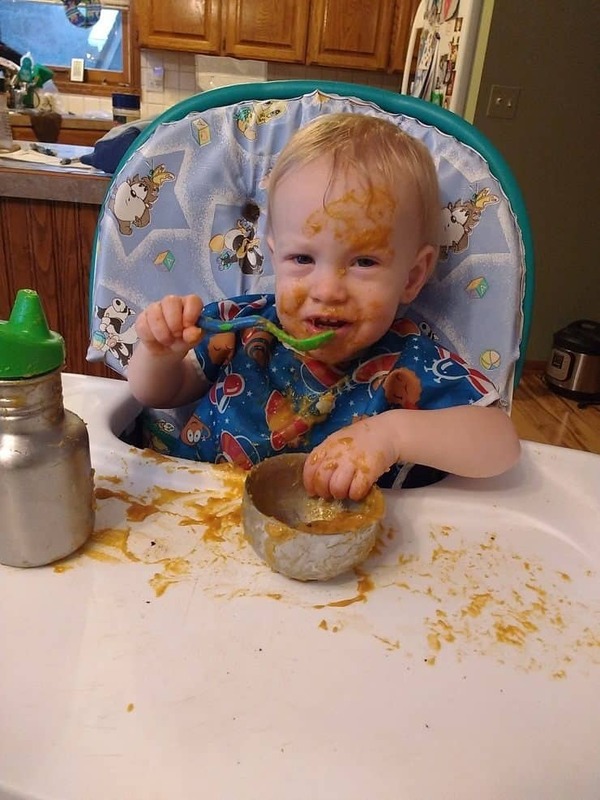 The recipe is so great for babies and toddlers, but once they want to “do it myself” it gets a little crazy. 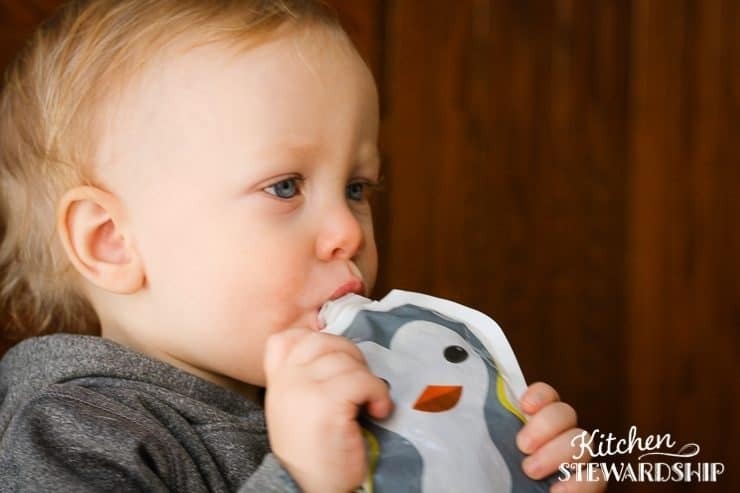 The porridge is definitely thick enough for little ones TO feed themselves – but how thick is your patience? If you’d rather spend an extra minute doing dishes than an extra few minutes cleaning up a writhing, screaming baby – because we all know getting one’s face washed is the biggest disaster ever to hit a one-year-old’s life – might I recommend this? The grain-free porridge goes great in a Squooshi, our favorite reusable food pouch, and you could mix it with a little yogurt to get probiotics in or thin it out. You say add 2 eggs for extra protein, but don’t give directions. Plus, with eggs, wouldn’t you want to heat to a certain temperature? When would eggs be added -during cooking? It might be a GAPS holdover, but we are still doing soups for breakfast. Once a month cooking, in the freezer, then in the slow cooker the night before. Baby loves it too! Will have to try out this recipe, looks delicious and will be a great change in our menu. Thanks! I’ve made this twice over the past few weeks and love it! Why limit it to breakfast??!! I’ve eaten it as a dessert, and I am eating some right now for lunch : ) I used pumpkin both times, but I will try sweet potato next time. This is such a flexible recipe, one that fits all my allergies! Thank you for this recipe…it was just what I was looking for!